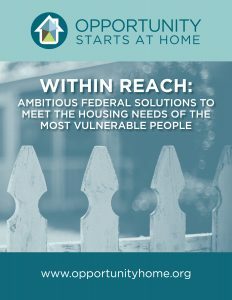 Leading national organizations from the housing, education, health, civil rights, anti-hunger, anti-poverty, and faith-based sectors have joined together through Opportunity Starts at Home, an unprecedented multi-sector campaign to advocate for more robust and equitable federal housing policies. Creating a new national program that provides temporary financial assistance to help cover rent for households experiencing unexpected economic shocks (e.g., loss of work hours, unreimbursed medical bill, broken car). Coupled with stability services, such as counselors and legal aid, this program would extend an emergency cushion to families in crisis, helping them avert the downward spiral of housing instability and homelessness. The campaign also identifies short-term priorities that Congress should act upon immediately, such as creating 500,000 “Opportunity Vouchers” designed for families with young children to expand their access to high-opportunity neighborhoods and increasing annual funding for the national Housing Trust Fund to $3.5 billion. The campaign is advised by a Steering Committee including: Catholic Charities USA, Center on Budget and Policy Priorities, Children’s Defense Fund, Children’s HealthWatch, Community Catalyst, Food Research & Action Center, NAACP, National Alliance on Mental Illness, National Alliance to End Homelessness, National Association of Community Health Centers, National Association of Social Workers, National League of Cities, National Education Association, National Low Income Housing Coalition, and UnidosUS. Research shows that housing is a critical driver of outcomes in many other areas of life: education, health, civil rights, food security, poverty reduction, and more. Stakeholders from these different sectors are increasingly recognizing the importance of affordable housing to their own priorities and goals, and through the Opportunity Starts at Home campaign, powerful new partners are working shoulder-to-shoulder to broaden the housing movement. To read the full Policy Agenda, please click here. Have your organization endorse the campaign’s National Policy Agenda by filling out the form below.